Hansen Park is a small island park surrounded by streets in Livermore where First St meets Holmes St. In the park is a rose garden, a fountain, a sculpture, and a old fashioned wagon on display. There's no sign for the park. Rose Map Here are the roses found in the park. Weather permitting, we will plan to spread alfalfa pellets and Kellogg's fertilizer in the rose garden on Saturday, March 16 . You will need to bring a container and a two cup measure. If sensitive to dust perhaps you will want a mask as well. Signup or drop in for any amount of time you have. There is a sign-in sheet on the metal box next to the fountain. If you remember the time you come, you may sign in and out at the same time. The number of hours worked is submitted to the City staff. As to the time, if you are an early bird, come earlier than suggested. Please drop in, signup at the LAVGC meeting or RSVP Dana Boyd or Lois Barber. See the LAVGC Yearbook for additional contact information. May, 2018. Our May 24 work party. January, 2014. In the last few weeks, thanks to the Livermore-Amador Valley Garden Club (LAVGC), there has been a lot of gardening activity at Livermore's Hansen Park. 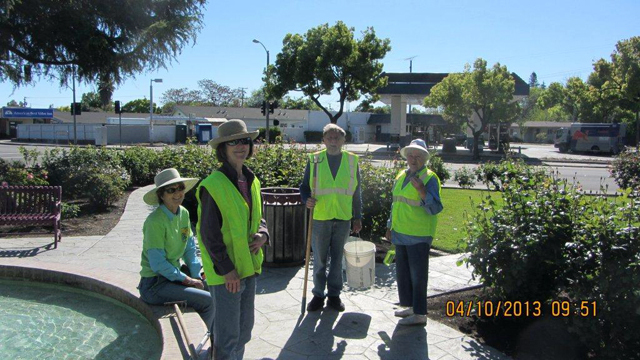 During the holidays and early January, LAVGC held three work parties to plant and prune roses at the park. On December 28, 2013 and January 2, 2014, a dozen Club members planted 82 roses, 75 of which were generously donated to the park by Star Roses. The goals of the planting were to replace aging roses, add roses found in the original 1960s garden, fill in gaps where roses were missing, and add a planting bed dedicated to roses hybridized by Walter Lammerts, a famous hybridizer of roses (e.g Queen Elizabeth, Bewitched, and Chrysler Imperial) who lived in Livermore in the early 1960s. In conjunction with the planting work parties, a group of members also pruned roses. The final rose pruning work party was held on January 11 with 22 members attending. All of the work parties were a wonderful example of "many hands make light work". Stop by the park and take a look at the roses. Pictures: January, 2013. A group of 23 volunteers pruned all of the approximately 460 roses in four and a half hours. The city improved the irrigation of the roses in February by adding more sprinklers and adjusting some of the overhead watering. Our March effort involved spreading Preen on the beds to inhibit weeds. Lydia, the LAVGC Hansen Park coordinator, has done a tremendous job in getting donations of fertilizer from Kellogg (enough to fertilize all of the roses) and alfalfa pellets at a reduced cost from Livermore Feed and Farm Supply. Alfalfa pellets are wonderful fertilizer, especially for roses. LAVGC has also been fortunate to have received a donation of two pallets (70 bags each) of worm castings from Sanctuary Soil and Feed in Vernalis, and one of the pallets went to Hansen Park. Pictures: April 2013. We had a work party to apply the 70 bags (~1 ton) of worm castings (donated by Mitch Davis of Sanctuary Soil and Feed), ~9 bags (450 pounds) of organic fertilizer (donated by Kelloggs and delivered to the City yard by Western Garden Nursery), and 350 pounds of alfalfa pellets sold to us at a reduced cost by Livermore Feed and Farm Supply. We continued the task of identifying the roses in the park, and throughout the summer we held several work parties to dead head the roses and pull weeds. In Summer 2013, we also developed a path forward to replace ailing roses and to add roses where roses have died. Anne Homan, Livermore's historian, has kindly supplied us newspaper articles with extremely valuable information on the history of the park and the original rose layout, and we will use that information to re-introduce some of the original roses back into the park. Pictures: November 2012. Over 16 members dead-headed roses and The Independent wrote 2 articles; one on the history of Hansen Park and another on the LAVGC efforts to restore the park to its former glory.